The Birth Chart is a snapshot of the universe at the time of your birth, and displays the planetary influences that will be most lively throughout your lifetime. The Comprehensive Birth Chart (CBC) system was introduced by Maharishi to take into account the influence of your closest living family members, which allows the Jyotish Pandits to make the most precise and detailed predictions. You will need to register your Comprehensive Birth Chart before applying for Maharishi Jyotish services. NOTE: Preparation of the CBC portfolio does not include a Maharishi Jyotish Consultation. 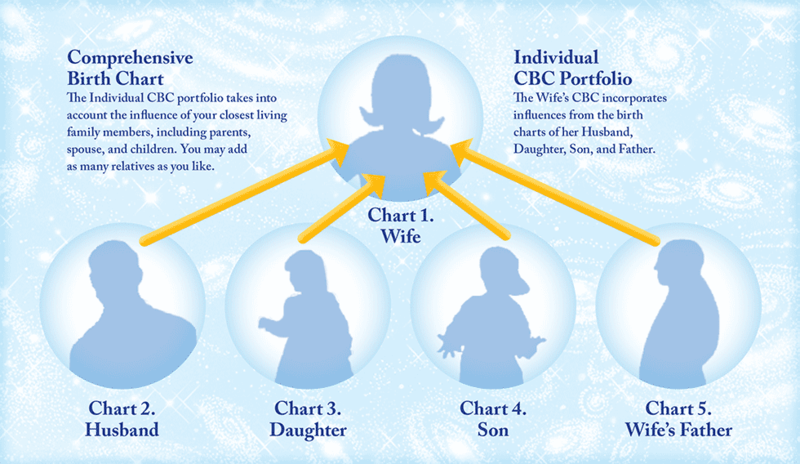 Individual CBC Portfolio You can register an Individual Comprehensive Birth Chart portfolio that includes as many family members as you like. If finances are a consideration, a Birth Chart can be created with just your own birth information, and relatives can be added later. The first step in registering a Comprehensive Birth Chart is to collect the birth location, date, and time for yourself, along with the birth information of your closest living family members—parents, spouse, and children—that you would like to include in your CBC portfolio. The Comprehensive Birth Chart program fee is $400 for yourself, plus $300 for each family member included in your CBC portfolio. If your parents, spouse or children already have a Comprehensive Birth Chart or are currently applying for one, they can be included in your CBC portfolio at no additional charge by selecting the Family Plan option when you apply. Print the Comprehensive Birth Chart Worksheet for Myself or Another Person. Before you begin the online application, gather accurate information for all mandatory fields. The online application must be completed in one sitting. You cannot save information and come back to finish it later. Complete the application to request a Comprehensive Birth Chart. Make your payment by Visa, MasterCard, American Express, or PayPal. The Family Plan When your parents, spouse, or children also register their own Comprehensive Birth Chart portfolio, everyone will receive a significant discount on their CBC application fee. Under the Family Plan, you and your parents, spouse, and children can each register their own CBC portfolio for just $400. NOTE: There is a fee of $300 for less immediate family members (siblings, grandparents, or other relatives) included in your Family Plan CBC portfolio. You can add these relatives once you have registered your Comprehensive Birth Chart. If any of your parents, spouse, or children already have a Comprehensive Birth Chart or are currently applying for one, enter their name and birth information in your application and they will automatically be included in your CBC portfolio at no additional charge to you. 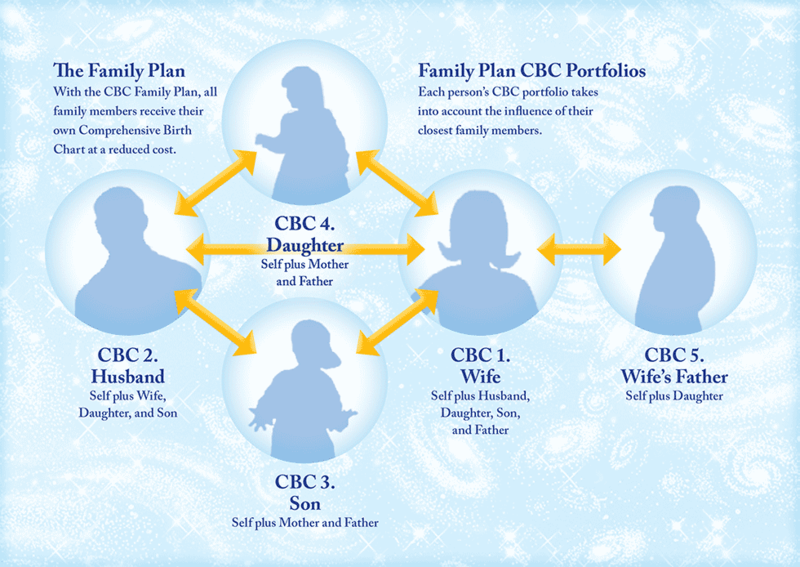 If a parent, spouse, or child does not have a Comprehensive Birth Chart, but is a part of your CBC portfolio, they can register their own CBC portfolio at any time for just $100 using the Family Plan. Once they have registered their CBC portfolio, they can add other family members, either individually or as part of the Family Plan. Business CBC Portfolio Businesses and other organizations can also take advantage of the Maharishi Jyotish and Maharishi Yagya programs to support their success and profitability. The business CBC portfolio requires founding details for the organization, plus birth information for business leaders who have a significant ownership in the company, or who serve as a Director, Trustee, or corporate officer. The Comprehensive Birth Chart program fee for a business or other organization is $400 for the business, plus $300 for each business leader who will be included in the organization’s CBC portfolio. Print the Comprehensive Birth Chart Worksheet for a Business or Organization. Additions to the CBC Portfolio You can add new family members to your Comprehensive Birth Chart portfolio at any time. You can add parents, a spouse, or children to your Comprehensive Birth Chart for $300 each. They will have the option to upgrade later to their own Family Plan CBC portfolio. If you already have a Comprehensive Birth Chart, you can add a new spouse or new child to your Individual CBC portfolio for $300 per person. Or under the Family Plan, they can be added to your CBC and receive their own full CBC portfolio for $400). You can add less immediate family members (siblings, grandparents, grandchildren or other relatives) to your CBC portfolio for $300 per person. A business or other organization can add new leaders to their Business CBC portfolio. There is a fee of $300 for each person added to the CBC portfolio. Print the Additions to the CBC Portfolio Worksheet for Myself, Another Person, or for a Business or Organization. Complete the application to request Additions to the CBC Portfolio. Locating Birth Information Birth information may be available from family records and birth certificates; hospital, state, or county records; and through online genealogy services. Contact a relative who has access to family genealogy documents, notes in family scriptures, baby books, etc. The hospital where the Applicant or a relative was born usually has the birth date and time in their Office of Medical Records. Be friendly and persistent. It may require special effort on their part to retrieve records from storage or a doctor’s files. The Office of Vital Statistics or the State Records Bureau often have birth records. They may be listed under the Department of Health and Human Services. Try both the state and county offices. At the city level, contact the town clerk. The county or city level may offer quicker access and lower fees. The website www.vitalrec.com has information on how and where to locate records. It includes links for international records. The website www.vitalchek.com allows you to order copies of birth documents. Say that the information is needed for research purposes only. A legal document is not required, but the time of birth is necessary. Request the longer form rather than a short version, since it is more likely to provide a birth time. It may be better not to say that it is needed for genealogy purposes, as this may delay your request. Sometimes only the Applicant or their relatives can access their own birth information, so you may need to ask for their help. If accurate birth information is not available, it may be possible for the Maharishi Jyotish Pandits to ascertain correct birth time based on an evaluation of life events. This procedure is quite detailed and must be requested through your Regional Maharishi Jyotish Office. See the contact page to the find the office nearest you.